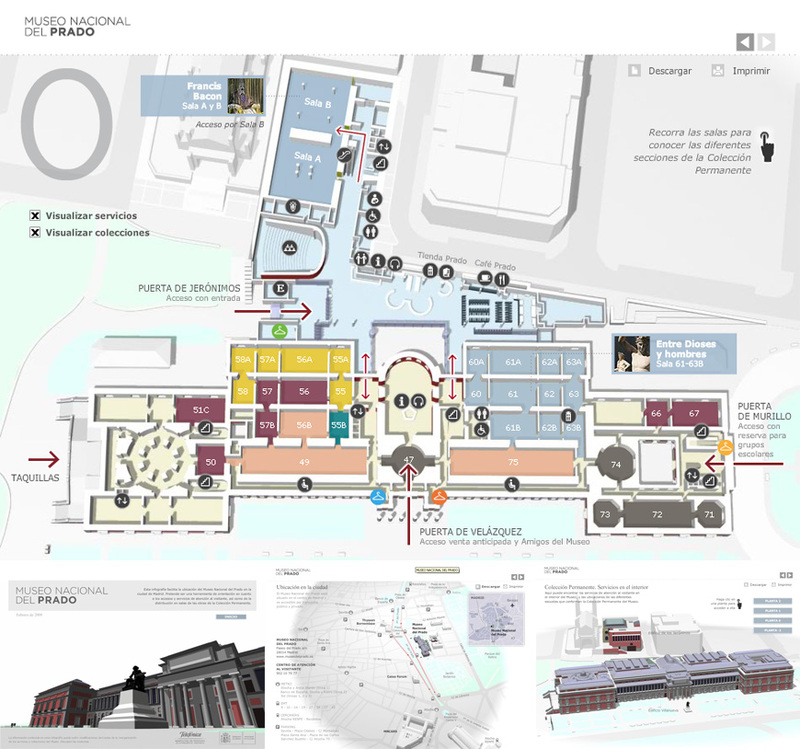 Virtual tour of National Prado Museum which gathers all the information regarding your visit: location in the city, accesses and services, and distribution of the works of the Permanent Collection. In order to develop this complex application, design (Illustrator, Photoshop and 3ds Max), video edition (Premiere and After Effects) and programming (Flash and ActionScript) tools have been combined. The result is an infographic which combines the audio-visual language with interactivity and the classical graphical resources, and which offer the Internet user not only the possibility to consult online, but to also download and print seven static graphics. For that purpose, it has been necessary to re-make each of them, not only because of the difference of screen/printer resolution, but also in order to constitute different languages: on the web the toptip formula is used, that is, the information is displayed when the cursor is placed on each point of the illustration, whereas the static graphic requires a caption. Both developments are available in two languages: Spanish and English. The itinerary starts at Puerta de Velázquez with a view of the main façade. As soon as the user clicks on the Start button, the camera starts a quick tour which offers a bird’s eye view with the location of the museum in the centre of Madrid, the services and external access in a perspective which is close to the isometric perspective and a conical view of Villanueva and Jeronimos buildings which is used as a portal to access the four floors housing the Permanent Collection. The itinerary finishes with a last movement of the camera to the initial position, at Puerta de Velázquez, with useful information and links to several areas of interest.